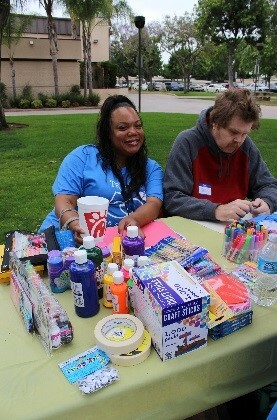 Each year, members participate in an art contest to design our annual members picnic t-shirts. This year, Priscilla R. was the winner. All members and staff wore the t-shirts while participating in an array of activities including but not limited to; arts and crafts, dominoes, water balloon toss, basketball, Frisbee, ladder golf, arts and crafts, dominoes and other board games, also there was a karaoke and dance contest. We all enjoyed a wonderful barbecue meal of hot dogs, hamburgers (with all the trimmings), beans, potato salad and cookies for dessert.